This has been a title I’ve been counting the days down to within my head; awaiting it North American release like a good fan boy. Sword Art Online is, in case you missed my previous write up, a Japanese Anime about a VMMORPG where the users have been trapped within the game, unable to log-out and forced to continue playing against they’re own will. There happens to be another stipulation built around all this as well; if they die, or get forcibly removed from the game, they will die in real life. So, seeing that the show/manga is growing ever more popular, obviously, a video game was right around the corner. The question remained though; how would a game, about being stuck in a VR game, translate over into a handheld adventure. So, clarifying something upfront with this game; this is non-canon to the events of SAO, and will not follow the same story of the show after floor 75. So to you faithful fans, you know what that means and I will leave it at that for everyone who doesn’t. This game is also two stories in one; Infinity Moment, and Hallow Fragment. Each has their own story arches, as well as unique characters. For Infinity Moment, the story is as follows. After clearing floor 75, Kirito and gang emerges successfully onto the other side, and enters into the unknown land of floor 76. Upon entering, the group quickly finds that for some reason all of their stats (Attack, defense, etc) had been reset to starting level, while they’re actual level had been left in tack. They quickly redouble they’re efforts to clear Floor 100 and in the process forging a new alliance with a strange woman called Strea. As for Hallow Fragment; while exploring one day, Kirito is randomly teleported into a zone he has never seen before, let alone the fact it isn’t on any of his maps. He quickly encounters a strange girl running through the forest by the name of Philla, behind her is a Skull Reaper. Which is usually the boss of Floor 75, but for some reason is a random foe in this area. Upon exploring, he finds that this new land is ridden with powerful weapons, and rich treasures. However he also finds that this place also is chalk full with powerful new foes, as well as the infamous Laughing Coffin guild. 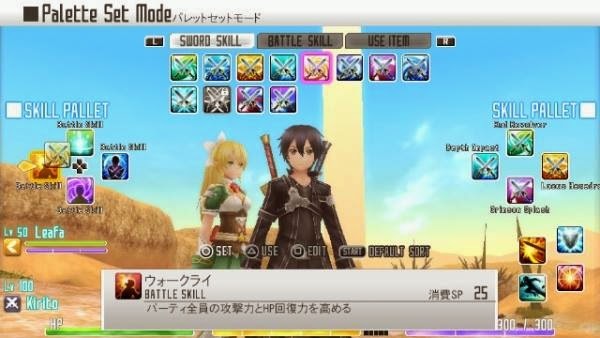 While searching the new floor they encounter new players who have no knowledge of SAO; Leafa, who is Kirito’s sister who has been playing ALO while he has been trapped in his coma, and strange girl who seems to be suffering from amnesia, after falling from the sky. So yes, as I said, this is completely non-canon, and should not be taken into context with the show or anime. Now granted, even though this is completely non-canon, you may end up like me, and have a bit of an issue wrapping your head around the situation. I understand about making your own unique storyline, but when you discount so many events that have occurred to create your universe, while sampling characters and events that happen in the series it starts to become confusing on exactly where the story is heading. Now the major, unrelenting draw back for both parts of the game that breaks immersion, as well is just plain annoying is the mind numbing amount of typos throughout the game. Barely a cut scene goes by without at least three words being miss-spelled, as well as grammatical errors, and nonsensical sentences. This is probably one of the sloppiest translations I’ve ever seen in any format, and it just shows the pure laziness on the developers half. This is why there is something called “quality testing”, and that whole team deserves to be fired. For the actual core story though, this will take you sometime to finish. 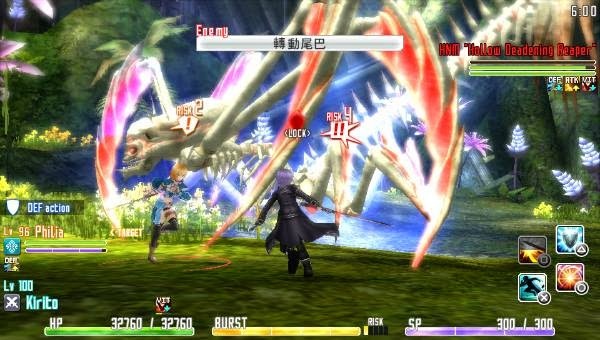 Clocking in around 80 hours’ worth of game play, SAO for the Vita will keep you busy for quite some time. That is, unless the game begins to annoy you too much. Since SAO is an MMO throughout the show and manga, I have to admit when I first learned that the game was a single player experience, let alone a portable one, it caused me to raise an eyebrow out of concern. Granted, there have been games that mimic the unique world of a MMO and successfully pull it off like FFXII for instance. How they accomplish this is by mimicking an MMO environment, and filling it with NPC’s that are pre-programed to act as humanly as possibly. Think Skyrim. This idea works well on paper; however, collision detection issues make the NPC constantly not only walk into you, and then proceed to bug out, but also walk/run into walls which tends to draw you out of the immersion. The primary focus of the game, as you might have figured by the name, is sword based combat. This combat is fast, fluid, and very aggressive and is the one major redeeming quality this game has at the end of the day. The combat has two layers of depth to it. You’re simpler, “keep-pounding-square-until-it-dies!” technique or you can take the other approach of leveling each of your weapon skills, as well as crafting the most powerful blades possible. Either of these approaches can get you to the same end result, but seeing as there is an added level of depth for your true RPG gamer was a welcome change. What isn’t welcome though is the immense amount of grinding that is required for you to become powerful, it also doesn’t help when the exp system in the game is a running joke. Kill an enemy 10-15 levels lower then you, which takes 10 seconds, and gain 250-500 exp. Kill an enemy 30 levels higher than you, which can take 10+ minutes, gain 750-900 exp. As I said… this system is a joke. If you are expecting people to grind their way through your game, you need to include a higher bounty on your higher leveled creatures to reward the player for taking down such a formidable foe. Besides that, environments are large, but with pre-set paths to explore. Some feel, and looked reused from other Bandi Namco RPG’s. For the most part they are your trope environments like, creepy castle, dark forest, and large valley. There are some unique ones sprinkled in, like some really cool levels where you’re on floated islands in the sky, but they are so few and far in-between that they are barely noticeable. There is also a town you can explore within floor 76, where you can check out Lizbeth’s armor shop, and Agil’s pub. However, I do admit I was disappointed that you can’t check out any other Floors towns, though they show them briefly once you clear the boss. You do have quite a few options when it comes to weapons. Anything from bows, to great swords will be at your disposal, each with their own skill sets, and growth tree. Each of these weapons will also have their own unique traits in speed, power, etc. These powerful skills can be used in the heat of combat by not only you, but by your ever present AI helper. Only thing is the AI isn’t exactly the smartest in the world, and you have an overall lack of control over their actions. You have your basic commands like “Heal” or “Use Skill” but no real control over if they will act defensively or over aggressively during combat. Which can lead to many headaches in a game where you, or your partner parish, and it’s over. Gratefully, one might say that this difficultly can be offset by the fact that even the enemy AI is horribly programmed! They are extremely predictable; usually within the first five seconds of combat they will use a special attack, which can be parried. If you are fighting a large group, sometimes one of them will forget that they are attacking you, and just straight up walk away from the battle, or turn their backs on you while you are fighting them. 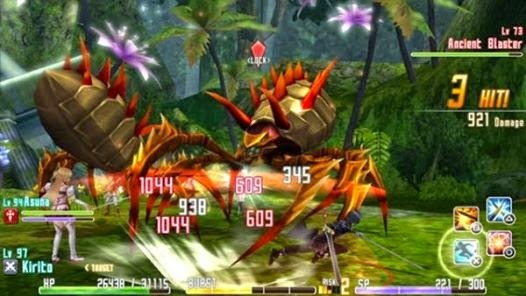 There is the inclusion of Ad-Hoc Multiplayer for up to four players at the same time, but seeing that its Ad-Hoc based, instead of online multiplayer I was unable to test it out, and I doubt it will get much usage because, if you really think about it, do you have four friends who own Vita’s, and are into SAO? As noted earlier, sword out does have a tendency of reusing the trope designs of your standard RPG game. What add to the level of mediocre that this game excels at is its sub-standard graphics. Where it could be understandable for Infinity Moments half of the game, seeing that these PSP quality graphics are throughout the full game, it was a tad bit of a disappointment. Environments are well detailed, yet washed out. Characters armor and clothing have a lot of interesting designs on them, which are destroyed by the low res graphics that are used in here. What is even more surprising is that seeing a decent amount of screen tearing and frame rate issues in a game that isn’t even technically challenging to the hardware it’s being run on. Gratefully, the cut scenes are hand drawn for the most part, and give it the shows true art style. In these segments the game does become fairly pretty, but knowing that it’s pre-rendered does not help the fact. As for sound, this is where the game does have some saving grace. The whole cast of SAO did lend their voices to the game providing a very authentic experience for the fans. However, one thing that was a little bit disappointing is that Kirito is only voiced for the first hour or so of the game, after that he is just text on the screen. It takes a bit away from the experience in the end, but nothing to terrible. As for the rest of the game sound design, it’s just another thing to add to the list of disappointments. The soundtrack is lazily thrown together, alternating between the better parts of 5 songs depending on what you are doing within the game. Besides that all the random noises you hear in the game sounds like they are cut from a stock soundboard, and lack any real originality. This was a painful one for me to review. I had my hopes set real high that this could be a killer app for the Vita, let alone a worthwhile Anime game. What it is in all reality is a shameless cash-in that keeps enjoyment on a rudimentary level, yet provides annoyance on so many more. The thing that disappoints me the most is how most of these problems could have been caught with proper quality testing. Which leaves me asking; did the developers really not care, or were the publishers pushing them on a release date that fell within the launch window of season two in America? Hallow Fragments does have its high points during battle that makes you forget about the faults within the title, but either during the fight, or right afterwards with awkward bugs where your character can become frozen in place. Another place a fan can derive enjoyment from is the story and the characters; however, it is also quickly taken away due to the insane amount of grammatical errors that draws you away from the immersion of the game. Overall, and I say this being a fan of SAO, I regret paying $40 for this game. Heck, even $30 would be overcharging for it in my opinion. My recommendation would be to wait until it goes down/or on sale for $20. Also, as noted earlier, not only will this game really only be enjoyable by your SAO fan base, it’s also a grind fest. So unless you have the time, and enjoy killing the same enemy for hours on end to become powerful, I would recommend steering clear.